The average adult person takes between 5,000 and 10,000 steps each day, and in order for this activity to be pain-free, it’s essential that all parts of the feet are in healthy working order. The plantar fascia ligament is one of the most important element’s of the foot’s structure; when it becomes subject to adverse conditions, the daily activities of standing, walking and running can be disrupted with acute or chronic pain. This article provides a simple explanation of the plantar fascia ligament’s role in your health and mobility, and identifies factors that can put this important ligament at risk. What Is The Plantar Fascia Ligament? It’s often useful to start by breaking down the meaning of an anatomical phrase. Plantar means ‘foot’ and fascia means ‘band’. Thus, the plantar fascia ligament is a band of tissue located in the foot, spanning the arch from heel to ball along the sole. The bottom of the foot actually has two major ligaments: the long plantar ligament and short plantar ligament. The ligament generally referred to as the “plantar fascia ligament” is the long plantar. A healthy plantar fascia ligament is strong enough to support the arch and elastic enough to bear the impact of the spring of your walk. The ligament should be able to flex within a narrow range of motion; if conditions are present that increase this range of motion beyond what is normal, painful health problems can result. How Does The Plantar Fascia Ligament Work? It may be helpful to imagine the Plantar Fascia as a piece of elastic. When you take a step, the toes and ball of your foot impact the ground first. The elastic ligament stretches as the ball touches the ground, lengthening the arch of the foot. Take a slow, exaggerated step if you would like to feel this stretching action. Then settle your heel down. As you lift your other heel for a second step, you are striking a balance with your toes and ball. The arch is poised in mid-air and is being supported by the strong tissue of the plantar fascia ligament until the heel comes to earth. As you can see, the plantar fascia offers both stretch and support, as well as bearing some of the weight of your body. Wearing improper, ill-fitting footwear is one of the key causes of problems with this ligament. Shoes should always be chosen for providing good support and a good fit, not merely for fashion. Becoming overweight places undue strain on the feet. If you’ve gained weight, consult with a doctor or nutritionist to develop a safe weight-loss plan that provides good nutrition while allowing you to gradually shed unwanted pounds. You can have too much of a good thing, when it comes to exercise. All adults should make time for moderate physical activity, but an extreme sports regimen can lead to severe ailments of the foot. Be sure you are balancing high-impact activities like running, jumping and basketball with adequate periods of rest each day. Other factors that it may be difficult or impossible to control include having a job that involves many hours of standing without rest periods, having been born with an anatomical abnormality that affects your gait, or the normal aging process that can result in reduced ligament elasticity. Podiatrists cite Plantar Fasciitis as the most common cause of heel pain in adults. In this condition, the plantar fascia ligament is flexing beyond a normal range of motion, engendering inflammation, and small tears in the tissue may result. 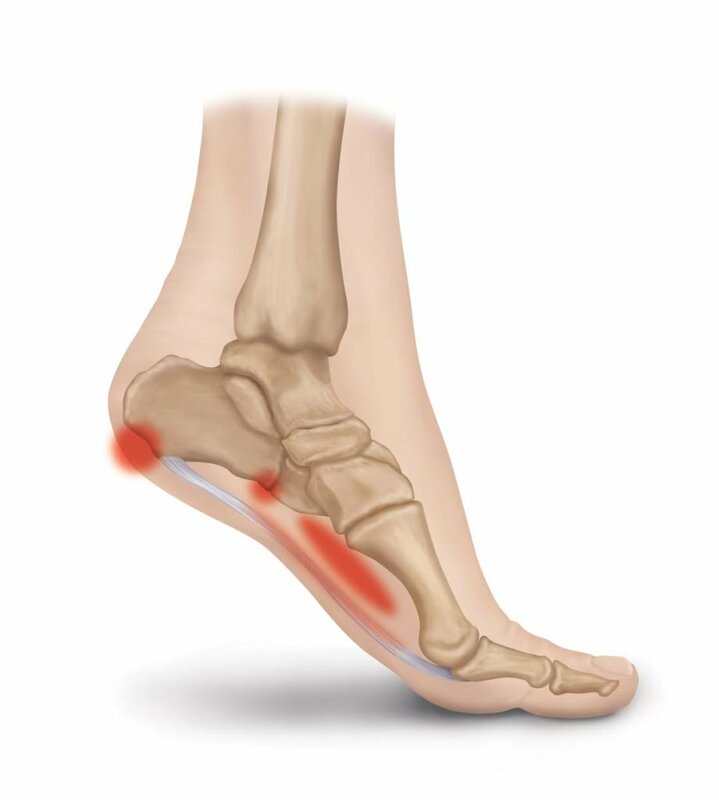 Heel spurs may often develop in conjunction with Plantar Fasciitis as the body creates hard calcium deposits in an effort to support the loose or wobbling plantar fascia ligament. Rest your feet twice a day for 20 minutes. Ice your heels while you rest them. Do plantar fascia ligament stretches each day. Commit to wearing shoe inserts specifically designed to treat Plantar Fasciitis. HTP Heel Seats are clinically-proven to provide relief from heel pain while treating the underlying cause. If your plantar fascia ligament has developed problems, committing to the above four steps can enable you to fully recover. When you consider the central role played by the plantar fascia ligament in so many daily activities, giving it the attention and support it requires makes perfect sense. Have Questions About The Plantar Fascia Ligament? Phone Our Foot Health Experts At 877-215-3200.